Step 1. Installed Docker Software tools . Successfully installed. $ docker build -t uber/android-build-environment . If I understand your question correctly: you technically don't even need to install Docker on your local machine in order to use it in your Bitbucket Pipelines (although it can be quite helpful for debugging). Bitbucket Pipelines can be configured to use a Docker from Docker Hub, and the one you mentioned (uber/android-build-environment) worked well for me. I like to organize my build process in it's own ash script file (build.sh) but that is optional (you could instead put multiple bulleted commands in the yaml file under the script directive). Examples of (and more details about) the bitbucket-pipelines.yml file can be found on the Language guides for Bitbucket Pipelines page. The licenses portion allows the Android Gradle process to automatically download Android dependencies for you, as mentioned in this answer. Make sure that you've enabled Bitbucket Pipelines (from your repo page: Settings -> Pipelines: Settings -> Enable Pipelines). Then just commit the bitbucket-pipelines.yml and build.sh and push to your BitBucket repo. The Bitbucket Pipelines build for your project should begin shortly after your push. The Bitbucket Pipelines will download the uber/android-build-environment Docker from Docker Hub and checkout your project and run the build.sh script within the Docker. The process you were describing of setting up the Docker on your local machine can be really helpful if your Bitbucket Pipelines build fails and you want to have the same environment running on your local machine so you can experiment with it and test changes to the build.sh script before actually committing and pushing to your repo. 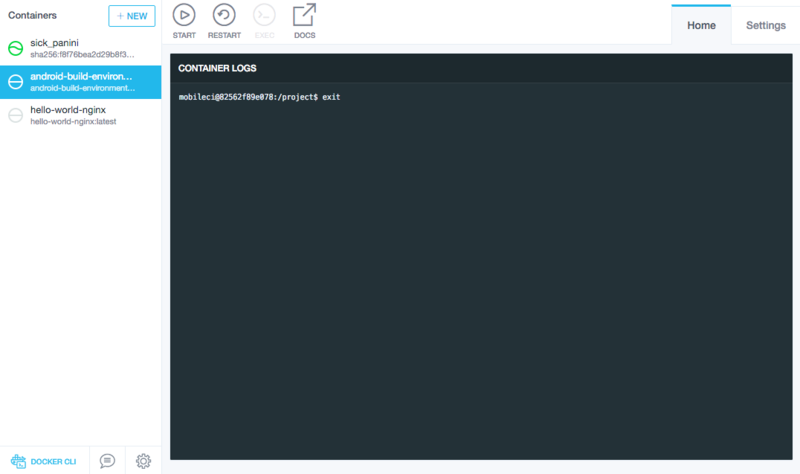 Which will start up the Docker (on your local machine) and put you in an interactive shell, so that you can browse around and gain a better understanding of the Docker environment. Also note that the Bitbucket Pipelines clones your repo in the Docker as part of the build process (which as far as I could tell) you had not done on the Docker running on your local machine, which may have led to some of your confusion about your build.sh script not being present. More details can be found at Mount a host directory as a data volume. As @ming-c pointed out in their answer, there are many other Docker images available on Docker Hub; it is certainly worth browsing around to see if you can find an image best suited to your needs. 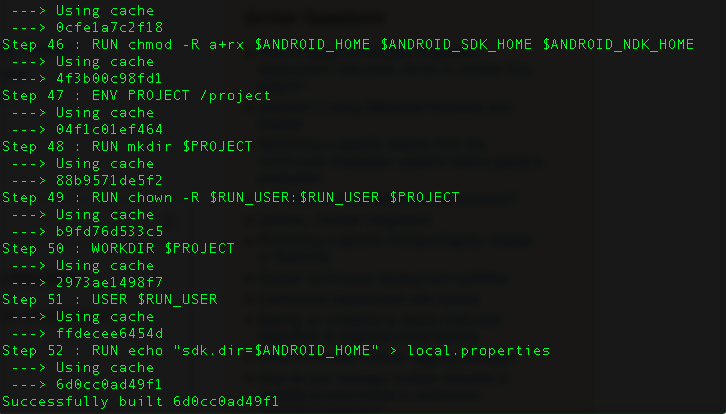 cd <android project directory>  # change working directory to your project root directory. 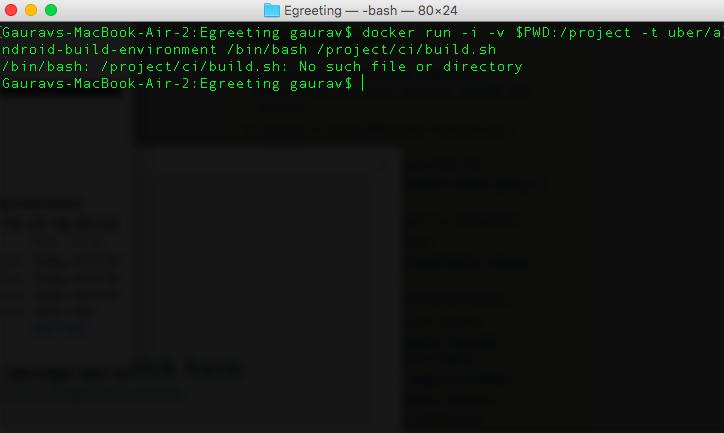 Your command docker run -i -v $PWD:/project -t uber/android-build-environment /bin/bash /project/ci/build.sh assumes the file /project/ci/build.sh is on the container. Are you sure you're running this docker command from the directory that contains it? and then check the results of ls -a /project when you get logged into the container. Another thing to make sure of is that build.sh is allowed to be executed, make sure of this by running chmod +x build.sh on it. Sign the application with the "release" signing key. Upload the apk files to the storage for future usage. Upload a version to the Fabric Beta for testing purposes. Not the answer you're looking for? Browse other questions tagged android continuous-integration continuous-deployment bitbucket-pipelines or ask your own question. How to create file execute mode permissions in Git on Windows? Android - What is continuous integration for mobile and what is the best way to do it in Android?